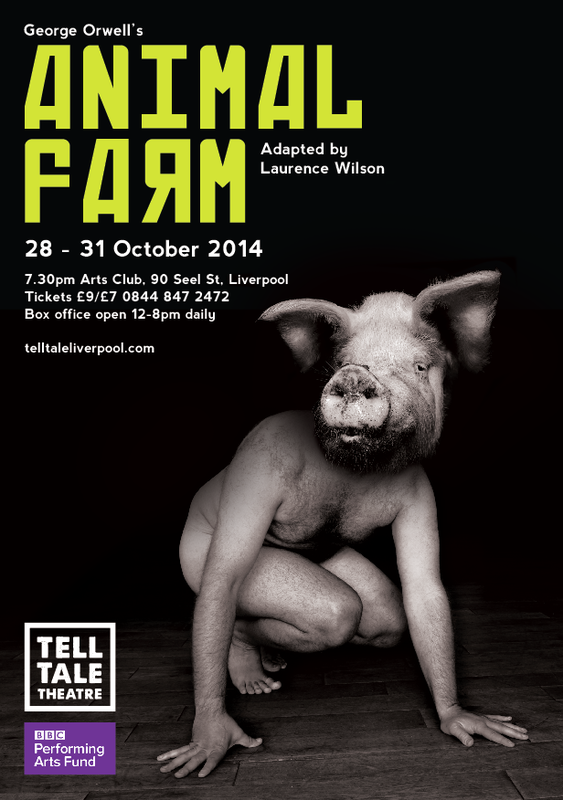 Tell Tale are worked with Laurence Wilson to create an experimental ensemble theatre adaptation of Orwell’s classic dystopian novel: Animal Farm. Tell Tale Theatre is proud to receive its first funding from the BBC Performing Arts Fund which has helped to support the production. This will enable Animal Farm to tour local secondary schools, allowing us to engage with young people to explore the novel as audience members and participate in a Tell Tale Theatre workshop. The adaptation promises to combine a range of multimedia, including drama, film, live music and shadow puppetry. The team will be working alongside award-winning writer Laurence Wilson to create their own theatrical adaptation of this world famous book. Wilson’s credits include Lost Monsters (Everyman), Blackberry Trout Face (20 Stories High) and Tiny Volcanoes (Everyman), and he will lead the Tell Tale team through an exciting collaborative and experimental writing process to create a new theatrical adaptation of Orwell’s political fairy tale. Book in person to avoid booking fee – box office open at Arts Club 12-8pm daily. Tell Tale Theatre is first and foremost a community. Established in 2009, we have created four highly successful full scale productions including; an adaptation of George Orwell’s 1984, User’s inspired by Irvine Welsh’s Trainspotting, Arthur Miller’s The Crucible and Ionesco’s The Chairs. Each process is aimed to push the boundaries of community theatre, and exceed expectations.